Prayer of St. Basil the Great after Communion, 4th cent., after the Eucharist. 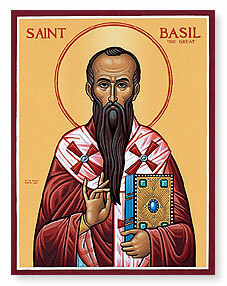 Basil was drawn from his retreat into the area of theological controversy in 360 when he accompanied two delegates from Seleucia to the emperor at Constantinople, and supported his namesake of Ancyra. There is some dispute as to his courage and his perfect orthodoxy on this occasion (cf. Philostorgius, Hist. Eccl., IV, xii; answered by Gregory of Nyssa, Answer to Eunomius' Second Book I, and Maran, Proleg., vii; Tillemont, Mém., note XVIII). A little later, however, both qualities seem to have been sufficiently in evidence, as Basil forsook Dianius for having signed the heretical creed of Rimini. To this time (c. 361) may be referred the "Moralia"; and a little later came two books against Eunomius (363) and some correspondence with Athanasius. It is possible, also, that Basil wrote his monastic rules in the briefer forms while in Pontus, and enlarged them later at Caesarea. There is an account of an invitation from Julian for Basil to present himself a court and of Basil's refusal, coupled with an admonition that angered the emperor and endangered Basil's safety. Both incident and correspondence however are questioned by some critics.